The analysis in this report is based on a nationally representative survey conducted from Feb. 22 to March 4, 2018, among 5,035 U.S. adults ages 18 years or older. 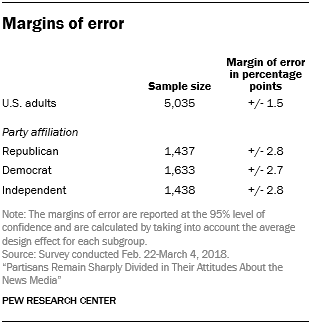 The margin of error for the full sample is plus or minus 1.5 percentage points. This report was made possible by The Pew Charitable Trusts, which received support from the John S. and James L. Knight Foundation, the Ford Foundation, Bill & Melinda Gates Foundation and the Open Society Foundations. Support for the research is part of Knight Foundation’s Trust, Media and Democracy initiative, which aims to strengthen the role of strong, trusted journalism as essential to a healthy democracy. The survey was conducted by the GfK Group in English and Spanish using KnowledgePanel, its nationally representative online research panel. KnowledgePanel members are recruited through probability sampling methods and include those with internet access and those who did not have internet access at the time of their recruitment (KnowledgePanel provides internet access for those who do not have it, and if needed, a device to access the internet when they join the panel). A combination of random-digit-dialing (RDD) and address-based-sampling (ABS) methodologies have been used to recruit panel members (in 2009 KnowledgePanel switched its sampling methodology for recruiting members from RDD to ABS). The dates of the web surveys for the 2016 and 2017 trends are Jan. 12-Feb. 8, 2016, and March 13-27, 2017. 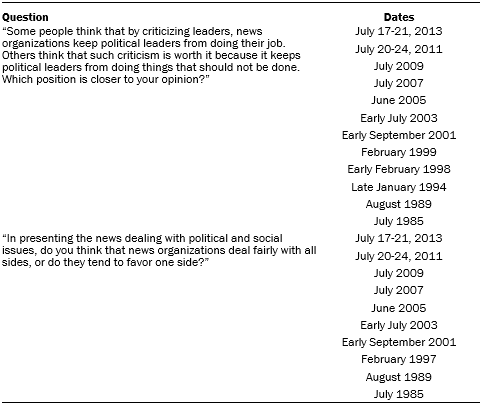 The following table shows the dates for the phone trends for the watchdog role and news media fairness questions.